Today’s recipe is for another beet juice. I originally made a apple beet lemon juice, which was delicious. This juice though is a little different. It is rooty and earthy, yet the juice is still quite sweet tasting from both the apple and carrot. The first thing you will taste in this apple beet carrot juice is the beet and then the apple followed by the carrot. I would highly recommend this juice to anyone who likes carrot apple ginger juice. Start by thoroughly washing your apple, beet and carrots. Make sure to clean your beet really well so that you don’t have any dirt left on it. I gently scrubbed my beet to get all of the dirt off. 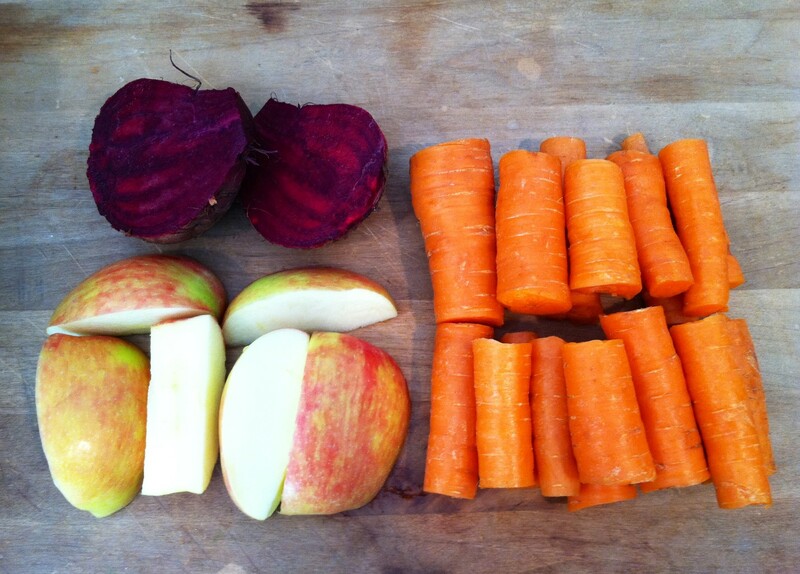 Once everything has been washed and dried, cut your apple, beet and carrots into smaller pieces that your juicer will be able to easily process. Now you are ready to juice. I started by putting in a slice of the beet followed by a piece of apple to help get the beets through my juicer. Once I had juiced all the beets, I continued with the leftover apple and carrots. Continue until all of your beets, apple and carrots have been processed. 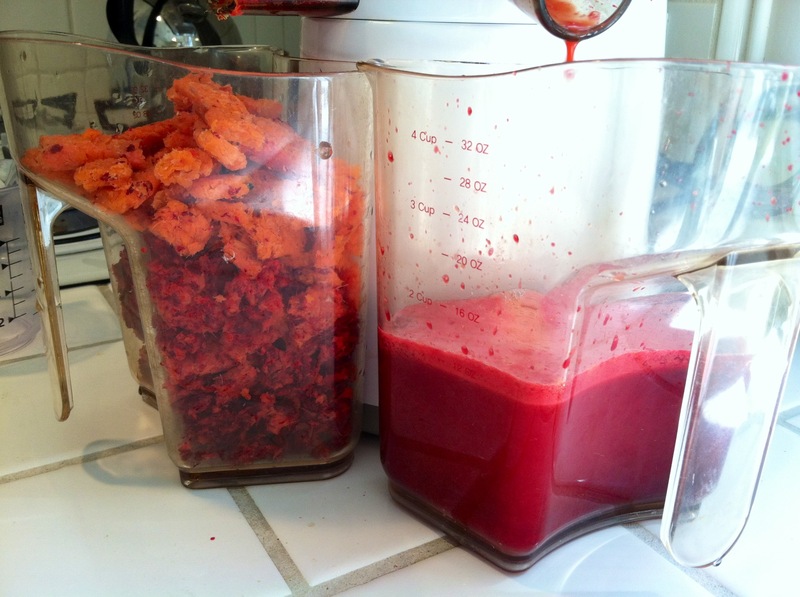 You will be left with a delicious, earthy, sweet apple beet carrot juice to enjoy! Drink immediately or store in an airtight container for up to three days. One serving of this apple beet carrot juice will provide you with 239 calories. It will also give you over 1,300 milligrams of potassium and 4 grams of protein. In terms of vitamins, you’ll be receiving high amounts of four different vitamins. This includes 10% of your daily vitamin E, 26% of your daily vitamin B-6, 49% of your daily vitamin C and over 700% of your daily vitamin A. This apple beet carrot juice will also provide you with quite a few minerals. Some of those include 10% of your daily iron, 12% of your daily calcium, 16% of your daily thiamin and 37% of your daily folate.